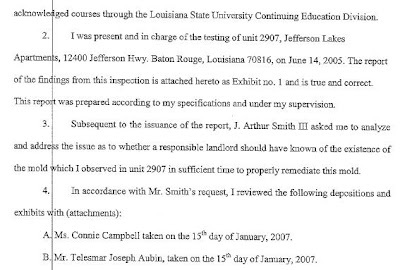 There are documented facts about a public health issue that continues to be blatantly ignored concerning Jefferson Lakes Apartments in Baton Rouge, La. and managed by Riverstone Residential. 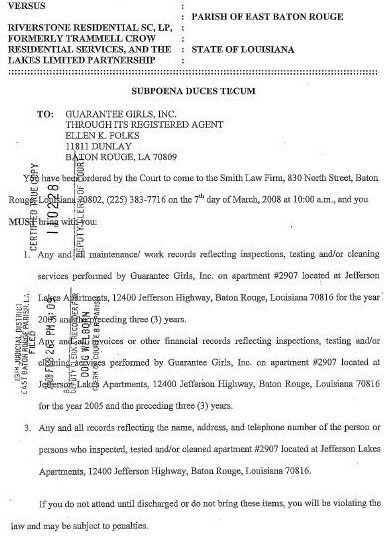 Documented mold inspection reports were ignored by the owners, Riverstone, and the Louisiana Housing Finance Agency when all were involved in a transaction concerning this complex. These unethical and unconscionable people leased an apartment to us (myself, my daughter, and her one year old baby) that was filled with years of toxin producing molds. Even with our report in 2005 and the report in 2007, people are still allowed to move into their toxic apartments and it seems they have no plans to change that – even after the reports have been exposed online. Our rights to pursue litigation have been manipulated rather obviously and those documents are just starting to come online. These people have a conscious disregard for peoples health and laws. How dare they be allowed to do this to us and to others and have it all be ignored. I have many more documents to post. Sometimes the truth is unpleasant. This whole experience has been “unpleasant” for us and grows more so everyday. Anyone with half a brain and some common sense can read the documents on this site and view the photos and see that mold has been a huge problem at Jefferson Lakes Apartments and they know about it and try to hide it. 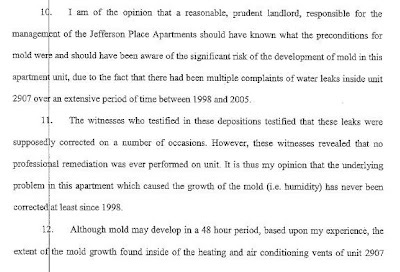 This extreme infestation of molds filling these apartments with toxins will be allowed to continue spreading at this complex while making many more sick (not to mention all the previous tenants) just as the corruption in this litigation spread to involve so many. This is all just fine with the owners, Riverstone Residential, the Louisiana Housing Finance Agency, and the State of Louisiana. Our health was violated by the owners of these buildings and Riverstone Residential and then our rights were violated by an unethical, lying, sorry excuse for an attorney – J Arthur Smith III and the unethical, corrupt justice system in the corrupt State of Louisiana. This is not over at all. Note – In the affidavit Jefferson Lakes Apartments is mistakenly named as Jefferson Place Apartments and is an “error” by the Attorney’s office. Guarantee Services Team of Professionals does an extremely large amount of service calls to Jefferson Lakes Apartments to vacuum out air ducts and dryer vents. An employee from this company came to our apartment along with the head of maintenance (this is documented in the depositions). This was after we were told they were coming to test (for the presence of mold) and then clean. By then we knew that could not possibly be done in one afternoon and told them we would rather wait until we could be away from the apartment. They came over to look anyway. The Guarantee Services employee was able to determine by simply looking at our mold covered air vents that the black growth was “dust”. “Dust” is the word management uses when people complain about this black stuff (mold growth) on their vents and then would have them vacuumed out. The plaintiff’s(me) attorney subpoenaed records from this company because they would show if air duct cleaning had been done in our apartment in the past and how many times. Since the perfectly clean and freshly painted over air vents were totally covered in black thick mold growth in just 3 months – it does not take a rocket scientist to figure out they would have obviously needed to be and were cleaned before. 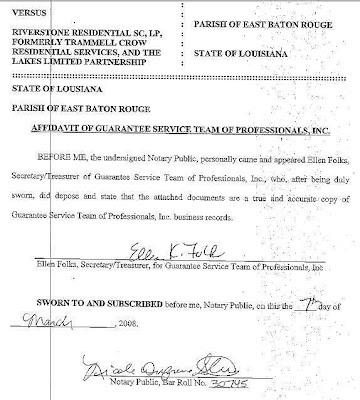 There is an Affidavit of Guarantee Service Team of Professionals, Inc. where secretary/treasurer Ellen Folks swears that the copies of records we were given are a true and accurate copy of their business records. There are many records showing service calls to the apartment complex but not the ones in the time frame asked for which is the whole point. This error was not corrected by the plaintiff’s attorney. 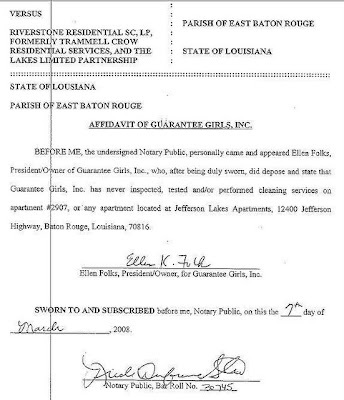 To possibly get around having to provide any records that might show service calls to the apartment we were in and to be able to swear never having performed any cleaning services is perhaps the reason for the Affidavit of Guarantee Girls, Inc. a company with a “similar” name and owned by Ellen Folks the secretary/treasurer for Guarantee Services. Simply put, there is a sworn affidavit for service records for the wrong time frame and there is a sworn affidavit from a company saying they have never performed cleaning in the apartment. Correct, they have nothing to do with this except to play a part in an obvious plan to get this case dismissed. Before I requested copies of these records I had spoken with “my” attorney a couple of times on the phone. I asked about the records from Guarantee Services and he would say “Girls” at which point I would correct him and say it is not Girls” its “Services”. When I received a copy of the subpoena to Guarantee Services for the records and affidavits I called him and told him it was “Services” and not “Girls” and had even looked them up and knew they were separate companies owned by the same individual. I guess all this “wrong doing” is the reason it took me four phone calls to finally get these records. Maybe all those involved thought I would not ask for copies. Things just did not seem right and they obviously are not. This is only one part. There is more. This was the response I received from my attorney when I asked why they did not ask for the correct records (2005 and the previous 3 years as stated in the supeona) instead of what was received (2004-2007). It gets more complicated with the different companies owned by the same individual with similar names but separate – see – plaintiffs attorney subpoenas wrong company – no evidence – more on that to follow. I say usually because I have photos of at least one other company they used. The records they sent are not what were subpoenaed because the records that were subpoenaed would have evidence of duct cleaning in the apartment we were leased. Usually that is the reason the attorney would want those records but not in this case. 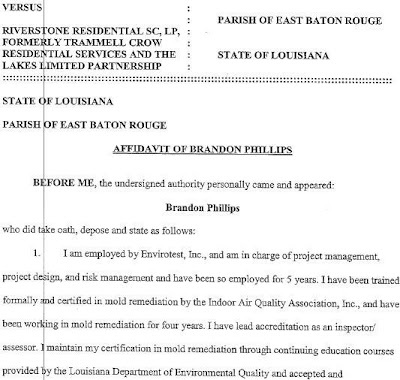 There was also no subpoena for records of say any other companies that clean air ducts and dyer vents. 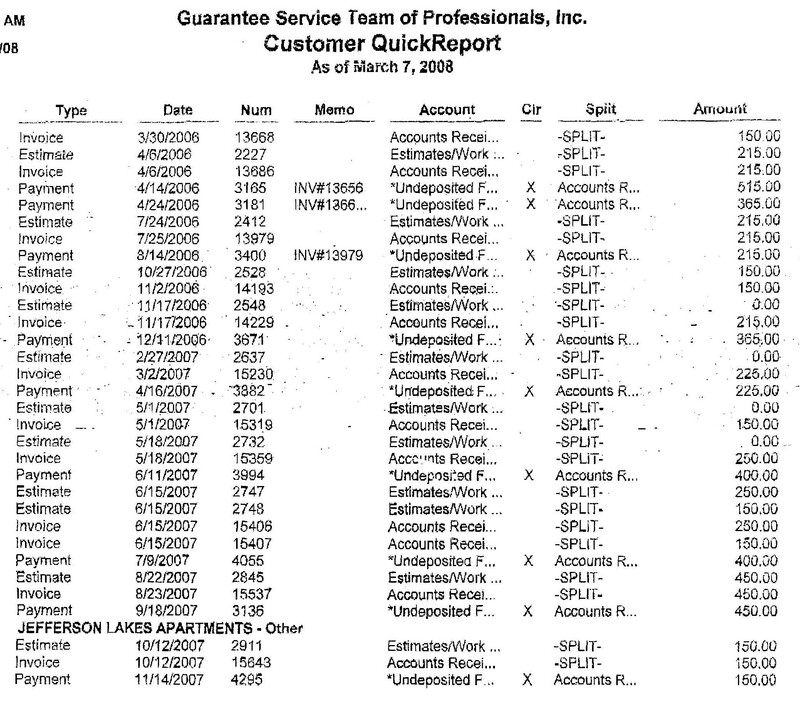 The records for 2005 and the three previous years were subpoenaed but here we have a miscellaneous collection (2004 – 2007) on a quick report with a selected few more detailed invoices (which have no particular importance over any of the others) thrown in. This random selection of records (even though it does show an obsessive amount of air duct and dryer vent cleaning) was thrown together for the judge, who wasn’t really going do more than take a quick glance (if that) then grant the motion for summary judgement for the defendant as was the desire of all parties including the plaintiffs attorney! See attorney malpractice and court documents. The amount charged for air duct cleaning is usually $215.00 and dryer vent cleaning is usually $150.00. 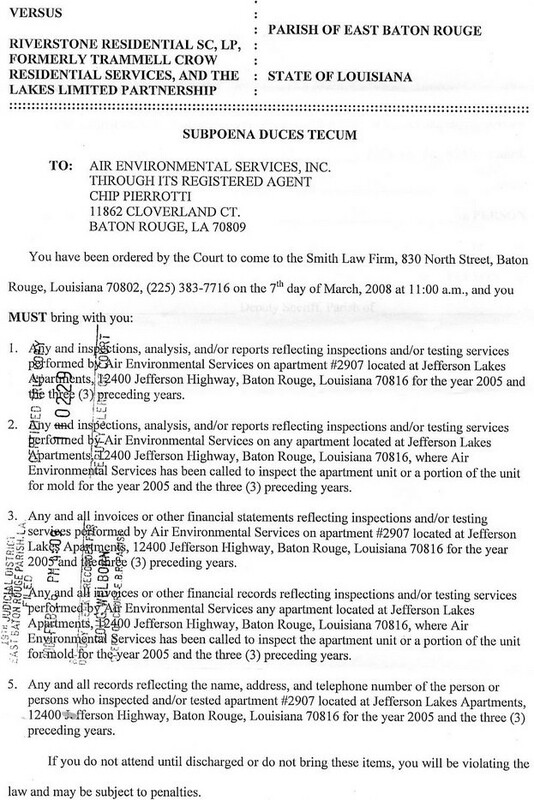 This is the Subpoena for Air Environmental – the mold testing company Riverstone Residential used at Jefferson Lakes Apartments #2907 (see apartment management orders 24-hour air test). This is also the company used for mold testing at the complex during a sale in 2007 and obviously ignored (see mold inspection reports). Again, records for 2005 and the preceding 3 years were subpoenaed. 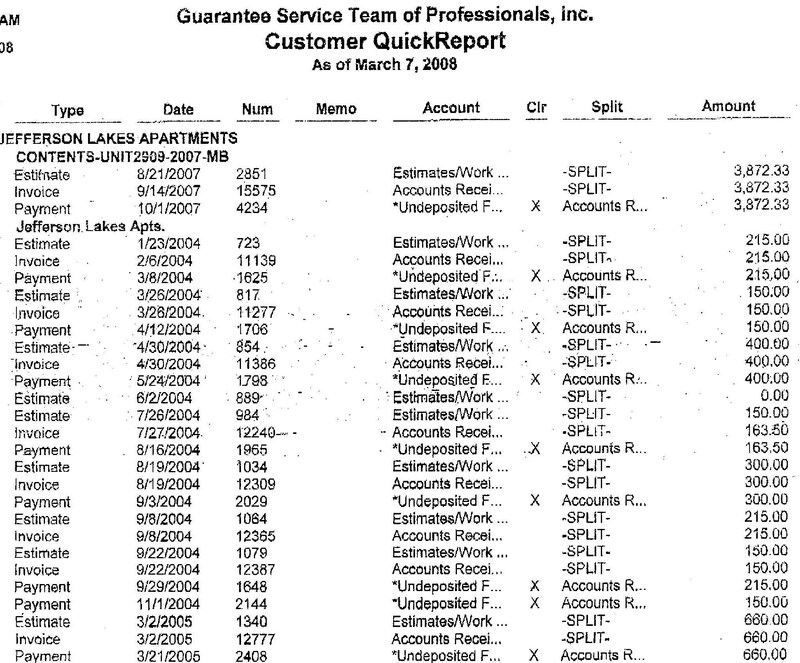 Again, just like the records for Guarantee Service Team of Professionals, records are received for the wrong years to avoid having evidence that Riverstone Residential knew of mold problems (see attorney malpractice). 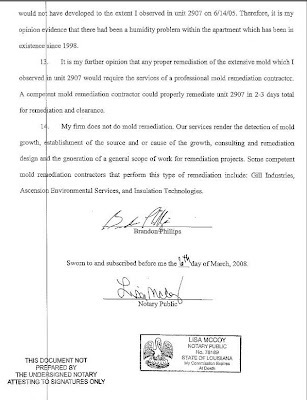 To avoid having evidence of Air Environmental having been to the complex before 2005 and therefore evidence that Riverstone Residential knew of mold problems, records for 2007 were sent. I’m not sure if this was as obviously planned as the Guarantee Service Team of Professionals records or if Air Environmental themselves sent the wrong records. Either way, this was not corrected. 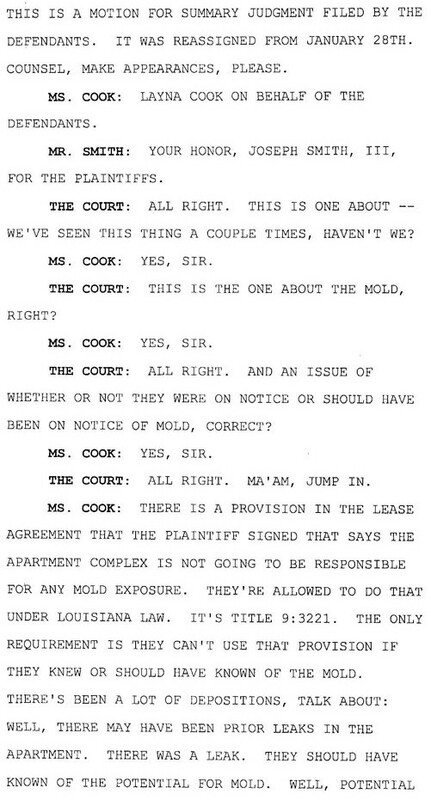 Unfortunately, for the defendants and my attorney this revealed the mold testing in 2007 for the complex that documented the mold issues there and just ignored. 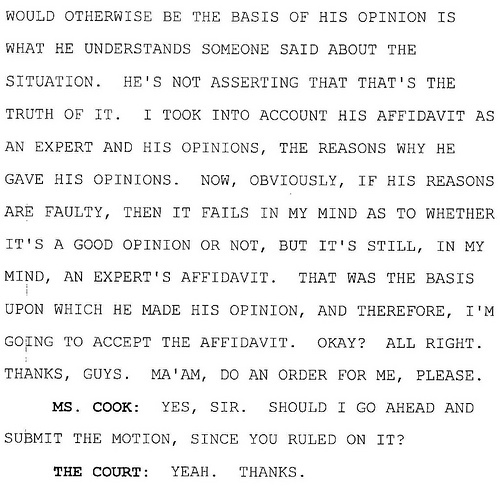 Again, there has been no answer on this from my incompetent and unethical attorney.